I must send a special shout out to my little brother Frank! This blog would not exist if it were not for him. He drove seven hours and spent four days putting this site together. I am forever indebted to him and his awesome family (who let him venture out alone). I have a special something for him, which I cannot post until he receives it. Can’t have him peeking to see what it is. 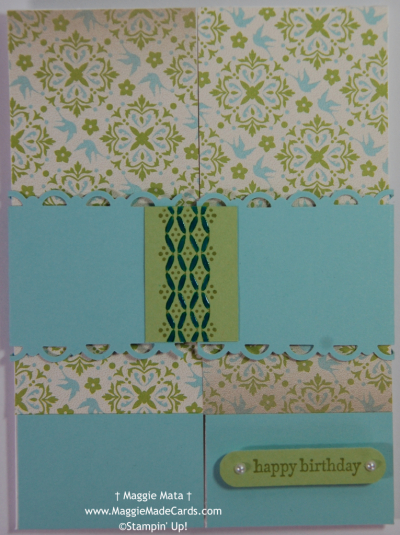 But in the meantime, I wanted to share a card that debuted at the Vendor Show on Dec. 10th. I also introduced two new products that will come out in the Occasions Mini Catalog that starts Jan. 4, 2012 and the Sale-A-Bration catalog that starts Jan. 24, 2012. 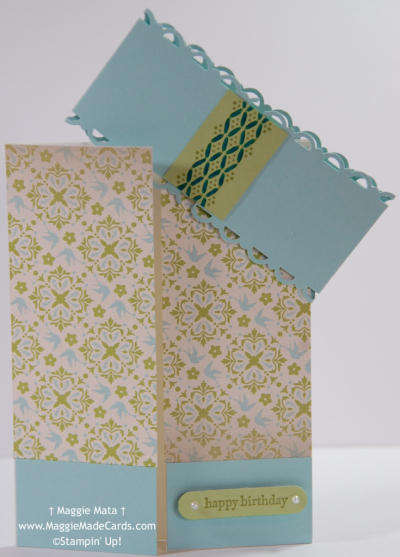 Send me an email if you’d like to see more and set up a FREE Make & Take class. I have product from these two catalogs in my hot little hands. =) Please feel free to share my blog with your family & friends. I love to read your comments and suggestions of what you would like to see. I’ll back real soon with more cards and projects. Give it a Wow: Lace Ribbon Border (122362); Simply Scored (122334); Everyday Enchantment Brads (126126) Coming in Sale-A-Bration… Jan. 24th, 2012. I used the Simply Scored tool to score the card to give the paper a little depth. (Taught to me by my upline, Ms. Mary Fish). I made two cards and introduced new products that will be for sale during the Sale-A-Bration campaign that runs from Jan. 24 thru Mar. 31, 2012. Send me an email and schedule a Make & Take Class now to check out the new products. One of the cards, I posted a few days ago… click HERE to see it again. Then there was the one for a co-worker, Tovi. He’s one of the first friend’s I made at work and has been a good friend ever since. I couldn’t forget his birthday because it falls on the same day, but two months later than mine… do you know when my birthday is? LoL. With this card, I couldn’t help myself, but use more Sale-A-Bration products… LoL. 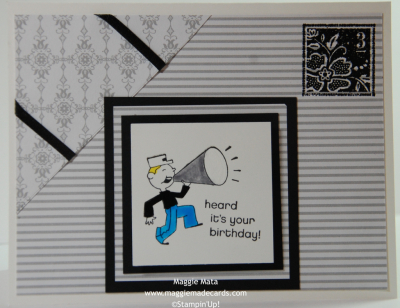 Like most of the cards I make, this one was for a dear friend I met in graduate school… Joy! She has been a great friend for the last 10 years and is full lof Joy, Love, and Hope (no pun intended =). It was an honor to make her this card on her special day. I have a special co-worker who has worked her little behind off on our Christmas Party at work. She set up fund raising, scheduled meetings, and made sure we had a party planner. I am so proud of her because she did it all and then some. She is an example for others to follow. Thank you Melanie.